The CL88020 LED Driver Integrated Circuit (IC) is an off-line sequential linear LED driver designed to provide 8.5W of LED power from a 120 VAC nominal input voltage. CL88020 is designed to drive a long string of inexpensive, low-current LEDs directly from the AC mains. 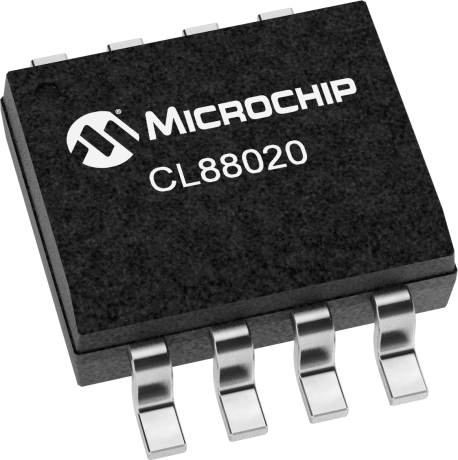 A basic driver circuit consists of Microchip Technology Inc.’s CL88020 LED driver IC, six resistors and a bridge rectifier. Two to four additional components are optional for various levels of transient protection, also with a low-cost NTC to assure remote over-temperature protection (OTP). No capacitors, EMI filters, or power factor correction circuits are needed unless the optional reduced light output ripple feature is desired. The CL88020 120VAC office LED Driver Evaluation Board is a complete solution consisting of an LED Driver (ADM00766) and an LED Load Board (ADM00767) powered directly from the 120VAC line and based on Microchip Technology's CL88020 Sequential Linear Driver. The CL88020 LED Load Board is designed to work together with CL88020 LED Driver Board (ADM00766) and consist of 10 LEDs series and parallel connected and driven sequentially by 4 TAPS LED Linear Driver, CL88020 , from 120VAC mains.